That's very cute! Sometimes mistakes are happy! I like all the balloons on your card! Gorgeous card Mo...the more balloons the merrier! They turned out so dang cute!!!!! Love it!!! Maureen!!! This card is AMAZINGLY cute!! I love ALL the balloons, I always say, there is nothing you can't fix with a little frosting! It is just so balanced! What stamps are the balloons? I just LOVE them!! So cute!!! I love this idea! 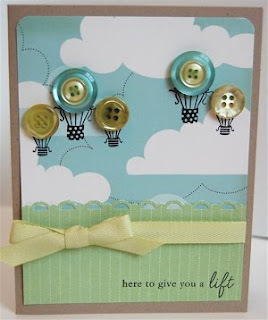 I just love this card, the air balloons are fantastic.. and what stamp is that, just a wonderful idea!! great stuff. Oh, this is so cute! I love all the balloons up in the sky!